It’s either creative genius or a paranormal disaster in the making - a new horror movie is underway and being filmed onboard the famously haunted ocean liner RMS Queen Mary! After the film’s script spent several years tucked away without a suitable production crew to bring it back to life (ironic pun kind of intended), the upcoming movie now has a bevy of paranormal movie specialists to execute the project (wonder where are all these death puns are coming from...?). Taking the helm as producer will be Gary Shore, who busted box offices in 2014 with the movie Dracula Untold. The film will also be produced by Nigel Sinclair and Nicholas Ferrall of White Horse Pictures, which gave us The Woman in Black, and Brett Tomberlin of Imagination Design Works, the team that created 2018’s creepy Winchester movie. While the RMS Queen Mary has been the subject of many documentaries, shows, and stories, the film The Queen Mary will be the first horror movie shot onboard the actual real-life ship. Will the on-site location provide the perfect spooky backdrop for the film’s plot? Or is shooting a horror movie on an already haunted location just tempting fate (and Queen Mary’s spirits) to sink the film? Known as one of the most haunted places in the world since it became permanently docked, RMS Queen Mary has a long history of hauntings. During her 83-year existence, the Queen Mary made 1,001 trans-Atlantic crossings, which were reportedly accompanied by 49 recorded deaths and a collision with another vessel that resulted in 239 deaths. Other lore claims that a murder took place in one of the ship’s cabins, a crew member was crushed to death by a watertight door, a woman dressed in all-white dances by herself in one of the luxury suites, and several apparitions of adults and children in old-timey garb sometimes wander the decks. Now functioning as a hotel Long Beach, California, the creepy Queen Mary certainly seems like a perfect set location to capture the spirit of fear! But cast and crew should be wary that the film doesn’t join Hollywood’s list of “cursed” movies - a number of classic flicks (many of them horror-related) that have been marked by disaster or ghostly activity (or both). Spooky films like Poltergeist, The Omen, The Crow, and others were plagued by murder and death, serious illness and injury, hauntings, and more during and after their filming. 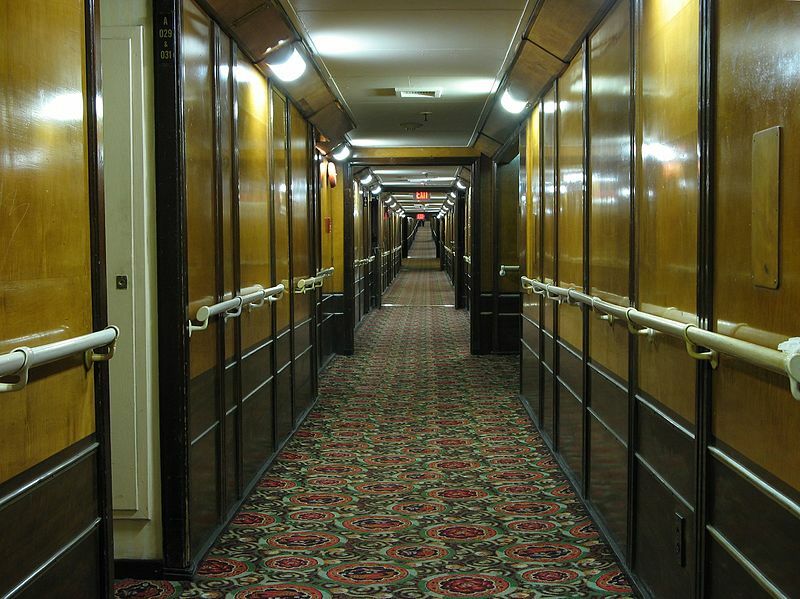 Setting the production of a horror movie inside the real haunted RMS Queen Mary may be an exact recipe for one such disaster (or ghostly activity, or both)! Only time will tell if The Queen Mary horror movie will ride the wave of success, or if a curse from the ship’s spirits will leave it dead in the water (that’s the last of the ghost ship puns, I swear). Will you be lining up for a ticket when The Queen Mary arrives in theaters? !